Wicked Awesome Adventure: 353 - Conclude PURSUIT MINIGAME! 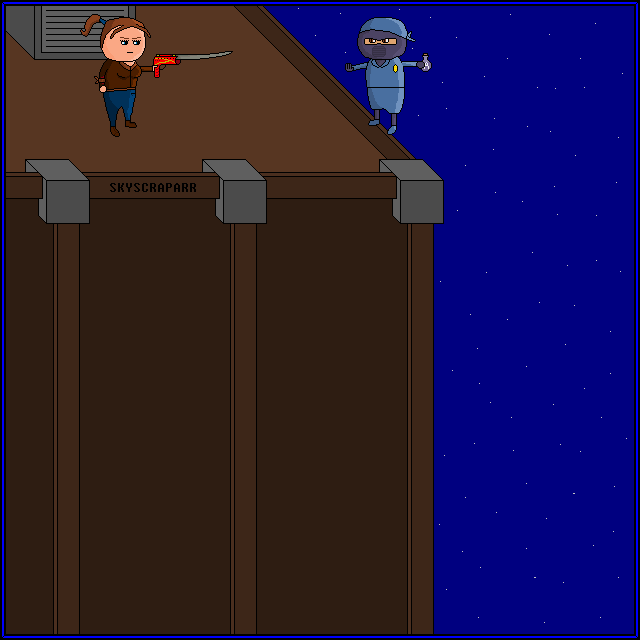 After continually alternating A and B (or maybe entering a CHEAT CODE) you have successfully pursued the NINJA to the top of a PIRATE SKYSCRAPARR, possibly the tallest BUILDING on CORSAIR ISLE. The NINJA rushes to the EDGE and turns around to face you, holding a BOTTLE over the VERY LONG DROP. Holy CRAP, that was a long CHASE. NINJA: Holy (huff) crap you are good at (puff) le parkour. JET: You're not (huff) bad (puff) yourself. NINJA: You sure (huff) you're not a (puff) ninja? NINJA: Right. (huff) I assume you want (whuff!) the antidote? JET: Yeah. (huff) Yeah, hand it over or (puff) I stab you (huff) or something... stabby. Holy crap, let's just take a second to catch our respective BREATHS. It's like you're still hitting A and B. You're going to go to bed with your fingers still twitching at A and B. Man. Whoa. Offer HIM 10 COOKIES in return for the ANTIDOTE. Offer to LET HIM OFF in exchange for the ANTIDOTE. Remind him that he was stabbed with his own (poisoned) katana and call his bluff. first off, a ninja wouldn't just randomly be carring an antidote. NINJAS kill people, not save them. the mere fact that he has an anitdote means that he intends to POISON someone (possibly JET) to force them into a DEAL for the anitdote. Tackle him off the edge and onto SHARP ROCKS below. Die. Switch to CAD.